Intestinal Research 2016년 첫호에 실린 Gastric lesions in patients with Crohn’s disease in Korea: a multicenter study를 소개합니다. 크론 환자에서 gastric noncaseating granuloma가 prognostic value를 가질 수 있다는 결론이 신선했습니다. Methods: Among 492 patients with CD receiving upper gastrointestinal (GI) endoscopic evaluation in 19 Korean hospitals, we evaluated the endoscopic findings and gastric histopathologic features of 47 patients for our study. Histopathologic classification was performed using gastric biopsy tissues, and H. pylori infection was determined using the rapid urease test and histology. Results: There were 36 men (76.6%), and the median age of patients at the time of upper GI endoscopy was 23.8 years (range, 14.2-60.5). For CD phenotype, ileocolonic disease was observed in 38 patients (80.9%), and non-stricturing, nonpenetrating disease in 31 patients (66.0%). Twenty-eight patients (59.6%) complained of upper GI symptoms. 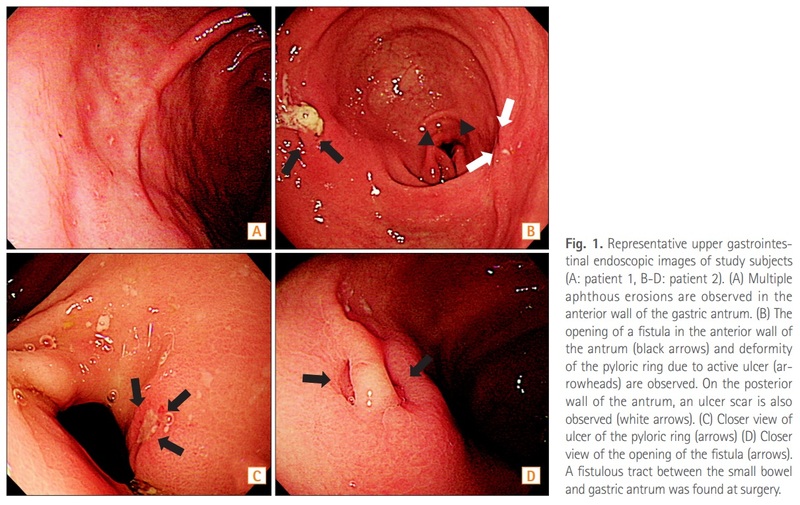 Erosive gastritis was the most common gross gastric feature (66.0%). Histopathologically, H. pylori-negative chronic active gastritis (38.3%) was the most frequent finding. H. pylori testing was positive in 11 patients (23.4%), and gastric noncaseating granulomata were detected in 4 patients (8.5%). Gastric noncaseating granuloma showed a statistically significant association with perianal abscess/fistula (P=0.0496).